When looking for your new home, do you consider the physical attributes of the area surrounding you? Would you like to be able to walk to the shops? Go for a walk, take the kids to a secure park and have a coffee? Would you like to have a communal area that facilitates useful free events for you, the kids or your parents? Here is a short interview with Hugh Weir to explain his important role of Urban Design and Landscaping consultant and how he creates a valuable community environment. So what does your role with LandGipps cover? My role with LandGipps occurs at both ends of the development process. Firstly in the initial Urban Design stage, then as a Landscape Architect to design and oversee construction of the landscape when we deliver the project. When a development opportunity is first identified, I assess the potential of that land and create conceptual layouts. I work within the planning framework to determine not only the optimal locations for roads, open space, drainage infrastructure, but also the community facilities and pedestrian connectivity. We want to make sure that every single person that lives in a LandGipps development has access to a healthy lifestyle through best practice urban design. Good urban design means that every house should be within walking distance of a local park and public transport, with access to local retail opportunities, schools and community amenities. Clear sightlines and circulation design is critical in contributing to a feeling of safety in the neighbourhood, which in turn gives you the confidence to enjoy the streets and parks provided at all times. Once we have finalised the urban design using the principles above, the project is handed over to the surveyors and civil engineers who work out the finer details of drainage and service delivery for each lot. At what stage do your develop the landscape concept? So the second part of my role is as a landscape architect. We develop the landscape concept or master plan at a very broad level during the urban design phase, which allows us to get a rough idea of what kind of spaces we want to create, and what kind of activities we want to cater for. Once the civil engineers have completed their drawings, it is my job to design the landscapes within the development. This includes the nature strips, street trees, parks and entry features. We consider the specific climate and soil conditions to specify grasses, shrubs and trees that will perform best and create beautiful streetscapes for our neighbourhoods. The larger projects give us opportunities to introduce high quality amenities such as sporting areas, playgrounds and picnic areas to the community. How do you consider the local environment? We use our local horticultural knowledge and work with Council officers to make sure that the species we select are appropriate for the local climate and soil conditions and complement the surrounding environment. Some projects include drainage corridors, which are a great opportunity to develop wetlands and linear parks that allow us to improve water quality for our catchments at the same time as creating fantastic places for the neighbourhood to get closer to nature and improve their health. What happens after the landscaping has been completed? All of the grasses, shrubs and trees need to have the best opportunity to establish their root systems and grow therefore LandGipps will maintain the landscapes for a period of between 18 and 24 months after completing the landscape works before we hand the asset over to Council to look after. A brand new landscape is vulnerable to extreme temperatures, pests and even vandalism, so we place a lot of importance on nurturing our work to its potential! 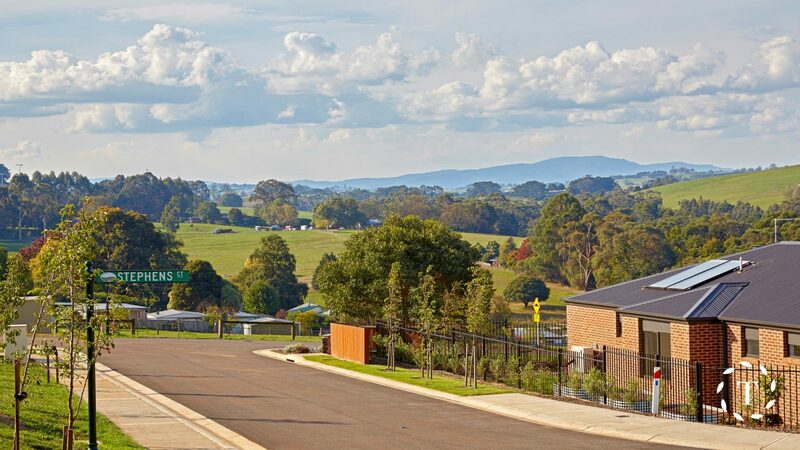 Not only do I see landscaping as critical in presenting a development to the public, but both myself and Landgipps recognise the importance of helping residents be proud of their investment. A well-presented nature strip may seem like a small thing, but in my experience it encourages residents to go the extra mile with their own landscaping projects, which really helps to make that development & community a great place to live. So how do you like working with LandGipps? For me, working with LandGipps is a fantastic opportunity to tackle each project from start to finish, and ensure that the vision from the earliest stages of the project are reflected in the finished product that our clients will live, love and laugh in. I am really excited to be helping deliver a range of residential developments that will contribute to the history and fabric of the broader communities of West Gippsland.